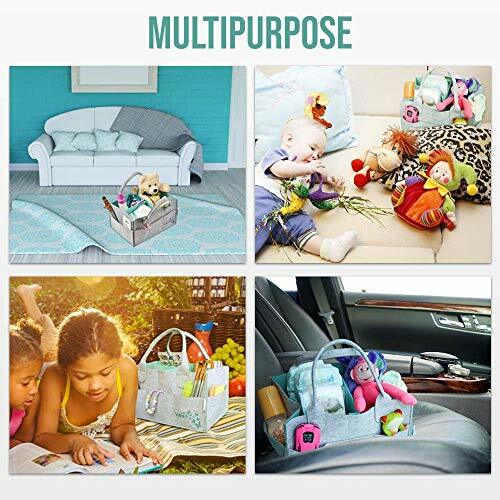 – IndusRiviera diaper caddy bag is designed in large size (13 * 9 * 7) to facilitate modern families – Moms, Dads and their busy lifestyle. To store diapers of all sizes and essential baby products – diapers, lotions, clothes, creams, wipes, changing pads, toys. – It has 8 external pockets – 6 small pockets and 2 large pockets to store more products – baby bottles, art crafts supplies. You can even use this while travelling to store office supplies and your wallet. This diaper caddy can be used to store all necessary items of your family. – Removable dividers are for your ease to redesign the bag according to your needs. Who says that carrying diapers and baby products has to be boring and difficult? – It is not the same boring design you have been using, it’s a two color theme bag with a design on its bag and pouch!! – According to demand of modern age parents, we have designed the bag using neutral colors grey and green. It blends in your nursery or any room or your office, wherever it’s needed. – It is a Unisex bag – Maximize your investment. 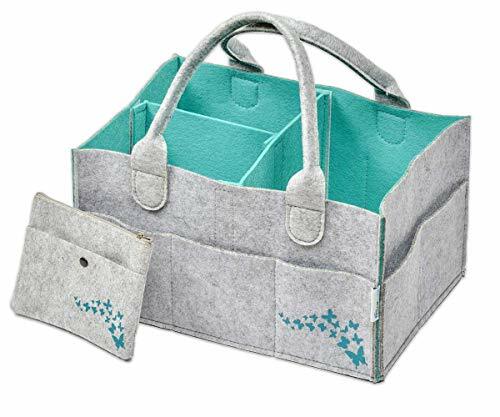 – Indus Riviera’s diaper caddy bag is made using Premium quality felt material. It can be carried around easily. – It is sturdy – designed and stitched to be used for multipurpose. What to get for a new mom to be? Easy – This multipurpose and practical bag will help to simplify her hectic life. Unlike other bags available it has a free pouch for mothers so they can carry it with bag and use it for their own personal needs. 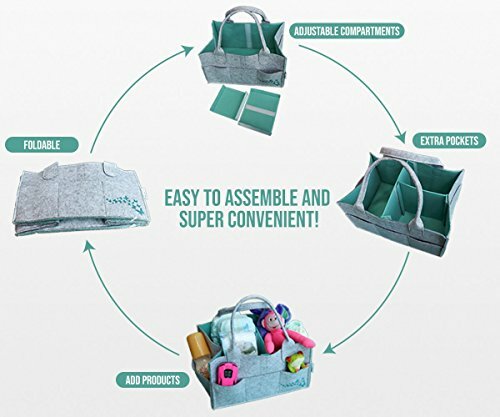 ONE STOP SHOP: IndusRiviera diaper caddy organizer will make everything manageable, easy and efficient for a new mother. All items can be stored at one place and will be easily accessible – all sizes of diapers, lotions, creams, wipes, breast pumps, hand sanitizer, toys and teether. LARGE AND CHANGEABLE COMPARTMENTS: Diaper caddy organizer has ample space to store all your baby’s products. 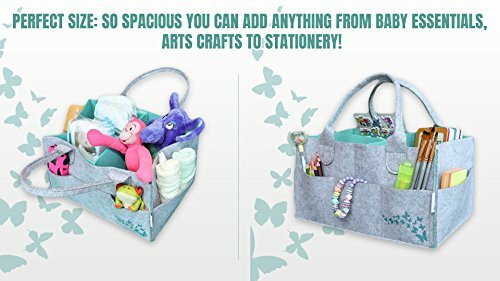 It has 8 external pockets which can be used to store all baby essentials and also other products of arts and craft, toys, books. Removable dividers are provided so you can change compartments and it offers versatility according to your needs. GENDER NEUTRAL COLOR: We decided grey and green color which will lighten up your baby’s nursery. 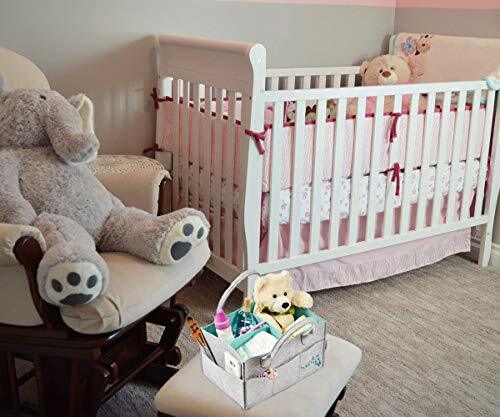 It can be used for baby girl or boy – Shop once and this organizer will fulfill all your needs. 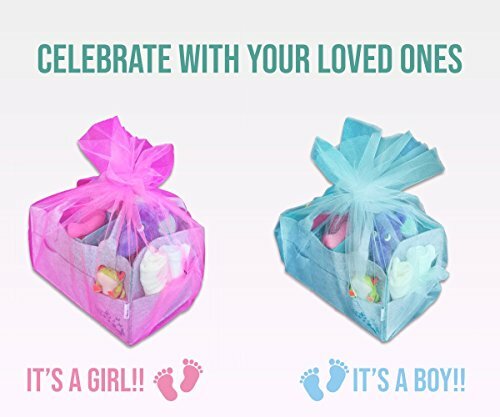 Even if you are not sure it’s a baby girl or boy just get this caddy bag and start preparing and decorating your nursery!! PREMIUM QUALITY AND PORTABLE: IndusRiviera uses high quality felt material which is easy to clean by just wiping it with a damp cloth. 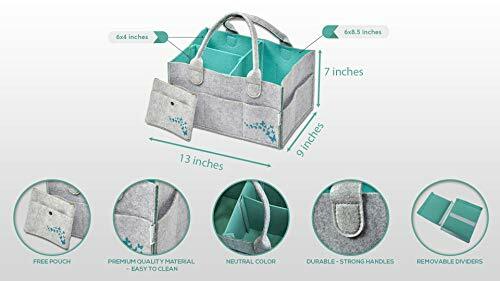 Wherever needed – be it a car, park, shopping mall or any friend’s house just toss the handles of this caddy bag over your shoulder and you are good to go! BONUS FREE POUCH: We have included a free pouch along with the caddy bag which is of the same design and material. 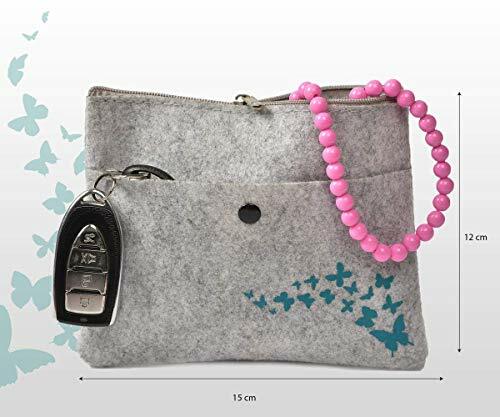 This cute handy pouch can be used by moms as a wallet or to store their cell phone, ID, credit and insurance cards, headphones and other personal items. We have designed bag and pouch to enhance the look of caddy organizer.